Warcraft II: Tides of Darkness is a fantasy-themed real-time strategy (RTS) game published by Blizzard Entertainment and first released for MS-DOS in 1995 and for Mac OS in 1996. Warcraft II: Tides of Darkness, earned enthusiastic reviews, won most of the major PC gaming awards in 1996, and sold over 2 million copies. Later in 1996, Blizzard released an expansion pack titled Warcraft II: Beyond the Dark Portal for MS-DOS and Mac OS, and a compilation titled Warcraft II: The Dark Saga for the Sony PlayStation and Sega Saturn. 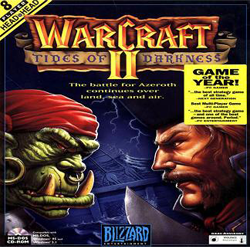 The Warcraft II: Battle.net Edition (titled Warcraft II: Deluxe-Edition in Europe), released in 1999, provided Blizzard's online gaming service, Battle.net, and replaced the MS-DOS version with a version compatible with Windows 95 through Windows XP (compatibility with Mac OS was maintained). The object of the game is to collect resources and produce buildings and units in order to defeat an opponent in combat on the ground, in the air, and at sea. The more advanced combat units are produced at the same buildings as the basic units but may require certain other buildings to be built before they can be made. The majority of the main screen shows the part of the territory on which the gamer is currently operating, and the minimap can select another location to appear in the larger display. The fog of war completely hides all territory which the gamer's has not explored, and shows only terrain but hides opponents' units and buildings if none of the gamer's units are present. This page has been accessed 18,129 times.